It is well known that weight training is a good way of maximizing muscle development and keeping in shape. But for many people, managing a large set of traditional dumbbells for proper training may be problematic, specially if they live in small apartments where there isn't much storage space. Furthermore, with traditional dumbbells one needs to keep buying heavier ones to ensure continuous muscle development, and when buying high quality and durable dumbbells, this can cost quite a bit in the long run. Fortunately, one can nowadays buy adjustable dumbbells that present advantages such as minimal space requirement, maximum security and excellent ergonomics. These dumbbells are equipped with a simple built-in mechanism that allows you to select easily the desired weight, and as such, they replace a comprehensive collection of traditional dumbbells by a single pair easy to slide under the bed when not used. Though adjustable dumbbells may appear to cost quite a bit more than traditional dumbbells, when one keeps in mind that they replace a whole set of them and enable complete training programs that can usually be achieved only in training clubs that require membership fees, their initial prices appears to be quite reasonable. This article will compare Bowflex and PowerBlock adjustable dumbbells for home use. These were not just the most popular adjustable dumbbells bought by Amazon customers at the time this article was written, but they had also received excellent reviews from most Amazon buyers (an average of at least 4.5 stars each out of 5 stars!). Selected Bowflex and PowerBlock Adjustable Dumbbels on Amazon. Bowflex and PowerBlock adjustable dumbbells are no doubt the most popular in their category. You will find below a description and comparison of these dumbbells. 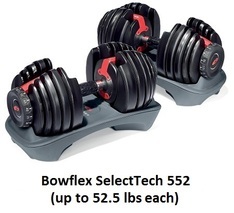 The Bowflex SelectTech 552 dumbbells which can be adjusted from 5 to 52.5 lbs each in 2.5 lb increments. These dumbbells are equipped with an easy-to-use selection dial for adjusting the weights which are round steel plates. Each of these dumbbells measures (16"L x 8"W x 9"H) and replaces 15 weights. 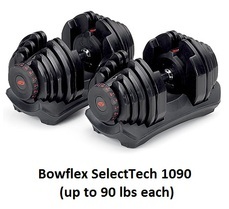 The Bowflex SelectTech 1090 dumbbells which can be adjusted from 10 to 90 lbs in 5 lbs increments. These dumbbells are equipped with an easy-to-use selection dial for adjusting the weights which are round steel plates. Each of these dumbbells measures (18"L x 10"W x 10"H) and replaces 17 weights. Both dumbbells work the same way: To select a particular weight all you need to do is turn the dial at each end of the dumbbell to the desired weight. When you then pull up the handle out of the base, one or more of the plates will stay in the base depending on the weight selected, unless you turn the dial all the way to the maximum, in which case all plates will come out of the base. They replace a large number of dumbbells: When you get a pair of SelectTech 552, you are really replacing 30 distinct weights, and when you get a pair of SelectTech 1090, you are replacing 34 individual weights. They have a simple weight selection mechanism: With just the turn of a dial you can automatically select the weight you need. They adjust to your workout plan: By planning your training with gradually incremented weights, you can gradually increase your strength and develop further your muscles. They are space efficient: No more need for a large number of dumbbells cluttering your home. They produce total body results: With the wide weight range provided by these dumbbells, you can both do heavy exercises such as shrugs and lunges and lighter exercises such as curls and raises. They allow quieter workouts: The durable molding around metal plates provides for a smooth lift-off and quieter workouts. You will not hear any clanging of metal plates! Comes with the free Bowflex® SelectTech® workout DVD: Contains over 30 exercises with over 80 variations. They come with a 2 year warranty for SelectTech 552 and 3 year warranty for SelectTech 1090. 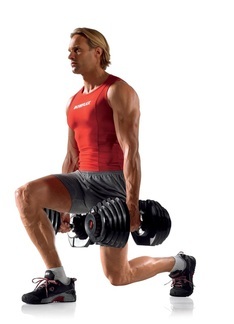 PowerBlock Elite 50lbs dumbbels each of which can weigh from 5 to 50 lbs, the equivalent of 16 dumbbells. Each dumbbell can be configured to provide the following increments (all in pounds): 2.5, 5, 7.5, 10, 15, 17.5, 20, 25, 27.5, 30, 35, 37.5, 40, 45, 47.5, and 50 lbs. These dumbbells measure (L:12", W:6", H: 6"). Note that the above listed dumbbells are all expandable to increase the maximum weight by purchasing add-on kits. For instance, if you buy the PowerBlock Elite 50lbs dumbbels, you can expand them later to 70lbs or 90lbs by buying add-on kits. But if you know the maximum weight you'll ever need, it is more economical to buy right away the dumbbell set that corresponds to that level of weight to avoid additional costs later. Both dumbbells work the same way: There is an easy-to-read color coded chart on the dumbbell that indicates what weight you are selecting. Once you select your weight, you simply move the weight selector pin under the slot that corresponds to the selected color and you'r set. As you lift the core handle, all the weights above the selector pin are lifted at the same time, creating thus a dumbbell with the desired weight. Note that to achieve the 2.5 lbs increments, the core handle of each dumbbell can contain two little bars known as adder weights that weigh 2.5 lbs each. So, the overall weight of the dumbbell will be incremented depending on whether you insert none, one, or both of these bars in the handle. 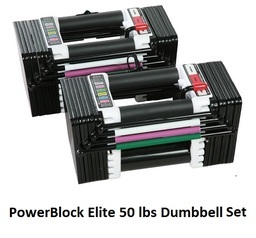 They replace a large number of dumbbells: For instance, when you get a pair of PowerBlock Elite 50lbs, you are really replacing 32 distinct weights (16 for each dumbbell). They have a simple weight selection mechanism: Selecting the color corresponding to the desired weight and moving the weight selector pin under the slot corresponding to the selected color takes mere seconds. They are expandable to higher level of weights: This requires the purchase of add-on kits. They come with a 10 year warranty. So which adjustable dumbbell set to buy? 1. Weight Adjustment: Though it takes only a few seconds to select the color that corresponds to the desired weight and place the weight selector pin where it needs to go, clearly the wait adjustment procedure on the PowerBlock dumbbells is more elaborate than the simple turn of a dial required by the Bowflex dumbbells. 2. Dumbbell Size: The PowerBlock dumbbells are smaller than the Bowflex. As a matter of fact, they are the most compact dumbbells on the market, and in general the smaller size makes the weights easier to manage during heavy exercises. 3. Style and Ergonomics: The PowerBlock dumbbells have an unusual design: they are rectangular with pillars in each corner surrounding the handle. While this should not be an issue as long as the weight adjustment mechanism works well, some people may prefer the more traditional and less "complex" round look of the Bowflex dumbbells. Indeed, certain users have reported that the unusual dumbbell design gives them some sort of unnatural feel, though this disappears after a certain period of use. Finally, if you have very large hands and wrists, there is a chance that the pillars surrounding the handle interfere with wrist movement. 4. Clanging Noise: Bowflex dumbbells have a durable molding around the metal plates that provides for a smooth lift-off and quieter workouts. with no clanging of metal plates. On the other hand, due to their design, the PowerBlock Elite dumbbells may produce some clicking and rattling noise during use. This is because components such as weight brackets, adder weights, etc. can somewhat move around. The noise is not loud and will not disrupt your training, but can be audible. 5. Warranty: Bowflex dumbbells come with a 2 and 3 year warranty respectively for the Bowflex SelectTech1090 and the SelectTech552. The PoweBlock Elite dumbbells come with a 10 year warranty. Please click the dumbbell of your choice below for price information or to purchase. Do you also need a sport bench to go with your adjustable dumbbells? Both Bowflex and PowerBlock have benches specially made to go with the adjustable dumbbells described above.